Latest PHP frameworks in 2014? PHP Framework ? Yes, it is great tool build your next awesome application. Choosing a framework for application is the basic thing which matters a lot. Recently there are various framework launched to you’re your work short and simple, flexibility to extend and give you choice to add customise features into it. There are various frameworks with lot features but very hard to quick start, due to documentation, hard to understand, messy syntax etc. Framework must be easy, simple syntax, enjoyable and provides good performance. Not putting extra pain on developers where it takes more time for developers to understand how really framework works and how to implement. I would say until you get interest on work you won't be able to do it better. Consider your client want the product in short duration, and for understanding the framework unless you are already expert in the framework, will take lot time. Framework should be simple, professional yet powerful. Isn't it? I comes many post in PHP groups, communities people are searching "Which is the Best Framework in PHP?". I would say don't waste your time, pick any framework which you feel comfortable and move on. Framework can't make you best developer, it can only provide you the base to get done some job. Unless you have very good understanding of the language you won't be able to write good software, not matter framework is best of not. Below are couple of latest frameworks which has great features in it, can have a look into. Phalcon is open source, full stack php framework for php 5. It optimized to give high performance. Though it is written in C-extension you don’t need to learn or use c-language. You are ready to fly with php classes. iii. Cygnite Framework provides various routing patterns. Write your restful api or create application, it is ready to go. v. Use native php or beautiful "twig" template engine to separate logic from your view page. You will just love it. vi. 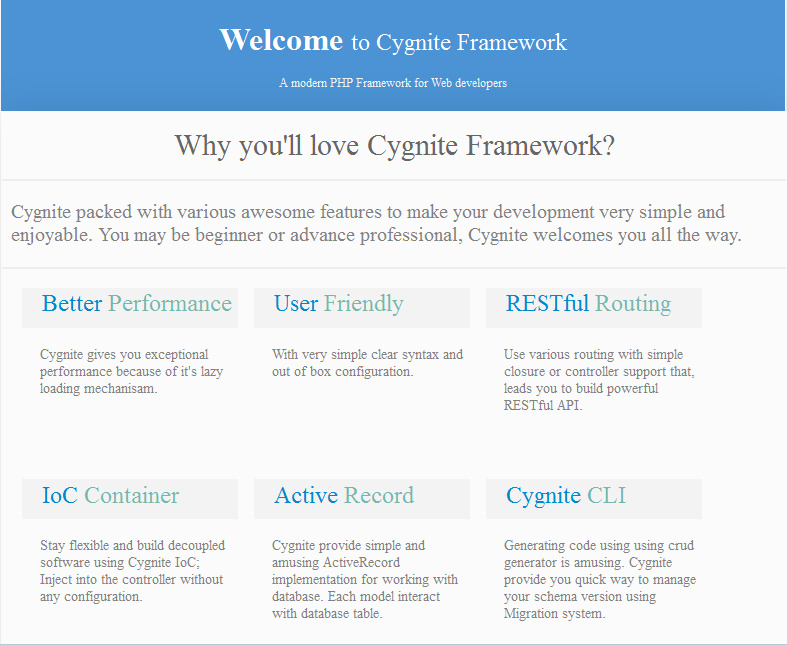 Cygnite Framework now with better error handler in it's core, which makes your development error free. Get ready to build your next awesome application with Cygnite. 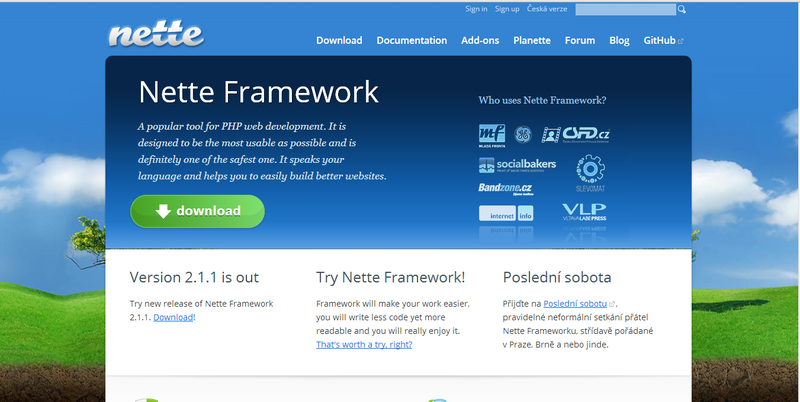 Nette Framework is a modern php framework with fully object oriented design. It supports ajax, kiss, mvc/mvp and flexibility. PHPixie is lightweight mvc framework for php. It is designed to be fast, easy to learn. It is originally fork of kohonaframework. CodeIgniter is one the good framework which I used for around 2 years, but it no longer upgraded. Symfony2 is most decoupled framework and extensible, better oop design patterns, doctrine supports. It is awesome php framework. The main thing which attracts me is “use full-stack framework or use it components”. It has strong proven community support and huge code base which supports you to go for enterprise level applications. Yii framework has good oop design patterns and activerecord support. Another good framework I used so far. Laravel4 has become more popular in last year. It has clean structure and code. But almost 70% of the core built on symfony2 components. Zend2 is better for enterprise development. It is little difficult to start for entry level programmers. It has huge codebase, and slow in performer. Choosing a framework is not tough, but make sure you are choosing a framework which powered by Composer. Pick any of the framework in which you are comfortable and also framework which supports latest PHP features (Min 5.3), start building your application. Hope this article informative. Please share with friends and leave comments below.